The Discngine Chemistry Component Collection is an extension to the standard Chemistry package for Pipeline Pilot. Generate and visualize scaffold networks, perform exhaustive molecular fragmentation or use Pharmacophore Graph to design powerful Matched Molecular Pairs analysis & lead hopping applications. Thank you for your interest in Discngine Chemistry Collection! You can download the datasheet here! Click here to proceed to download ! This application demonstrates the use of Discngine Pharmacophore Graph for lead hopping. 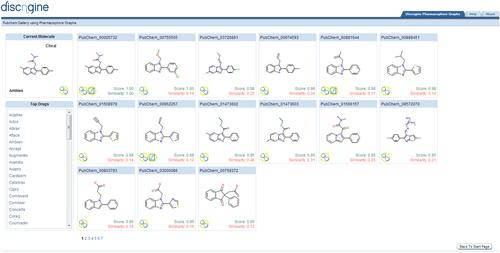 The goal of the strategy is to identify compounds structurally different from the reference (query) compounds yet displaying similar biological activity. The graph matching score as well as the Accelrys Pipeline Pilot ECFP_4 fingerprint based similarity measure is shown, the higher the graph matching score, the better. Similarly, the lower the fingerprint based similarity, the more structurally different the compounds are.